14 teams will be in action Wednesday led off by an enticing matchup between the Nuggets and the Nets. Elsewhere the Spurs travel to Oakland to face the Warriors without their starting point-guard Derrick White. White is out with a heel injury and based on their last game, Davis Bertans appears likely to remain in the starting lineup. He possesses an intriguing skill set and is worth picking up as long as he can play 30 minutes per night. I will analyze all seven games, attempting to extract value from those borderline players in action. Mason Plumlee (36%) – Watch: Plumlee put up a double-double Monday, finishing with 15 points and 11 rebounds. Nikola Jokic was in foul trouble and Paul Millsap was out and so this line needs to be put into perspective. If Millsap misses another game, Plumlee could be worth a speculative pickup. Trey Lyles (26%) – Drop: Much like Miles Plumlee, Lyles took advantage of Paul Millsap’s absence, ending Monday with 20 points in 29 minutes. Millsap appears likely to return Wednesday which will limit Lyle’s opportunities. DeMarre Carroll (46%) – Stream: Carroll finished with just eight points Saturday, going 3-of-8 from the field. Prior to this, he had been solid enough in the points department and if you need a boost in that category, he is at least worth considering. Shabazz Napier (43%) – Add: Napier went 4-of-15 from the field Monday, also missing all 10 of his three-point attempts. He is providing points, assists, and steals at the moment but the field-goal percentage remains an ongoing issue. Ed Davis (32%) – Stream: Davis had arguably his worst game of the season Monday, finishing with just two rebounds in seven minutes. He should be given a pass here and based on his recent numbers, should be able to find his way to more rebounds moving forward. Kenrich Williams (30%) – Stream: Williams struggled from the field Monday but salvaged his line with eight rebounds, two steals, and one block. The Pelicans will likely be without their primary frontcourt players again Wednesday meaning Williams should be streamed in once again. Darius Miller (20%) – Stream: Miller hit another four triples Monday and as long as he is playing big minutes, should be considered if you need points and threes. Frank Jackson (15%) – Watch: Jackson was disappointing Monday and outside of scoring, has contributed very little to boost a fantasy teams value. He should still remain closely monitored until after the trade deadline with the Pelicans a chance of unloading a few assets. Cheick Diallo (11%) – Watch: Diallo scored at least 12 points for the second straight game, adding 13 rebounds in 22 minutes. Kenrich Williams is the pickup here, however, Diallo has played well over the past two games and certainly has a fantasy friendly game when given the playing time. Tim Frazier (11%) – Stream: Frazier was not at his best Monday, finishing with just three assists in 18 minutes. In his four games prior, Frazier had recorded a combined 32 assists and so owners could still stream him in hoping he gets going again Wednesday. Wayne Selden Jr. (12%) – Stream: Selden popped up on the injury report prior to Wednesday but appears on track to play. He has been up and down over the past week, alternating good and bad performances. Through it all, the playing time has remained and he clearly has the most upside of all the Bulls fringe players. Jordan McRae (6%) – Watch: McRae continues to trend up in terms of both production and playing time. He filled up the boxscore Monday, ending with 20 points, five rebounds, two steals, two blocks, and one assist in 26 minutes. He is not an add just yet but should be monitored through the deadline and beyond. Malik Monk (49%) – Stream: Monk scored 12 points Tuesday but had no other stats in just 14 minutes. Trade rumors continue to circulate which could impact Monk no matter the outcome. He could still be streamed in if you need points but there is certainly an element of risk here. Cody Zeller (37%) – Add: Zeller returned to action Tuesday, ending with six points, 11 rebounds, two assists, one steal, and one block. He came off the bench but saw more playing time than Bismack Biyombo and it should only be a matter of time until he is starting. He doesn’t have the highest upside but should provide solid numbers on a nightly basis moving forward. Dwight Powell (34%) – Stream: The Mavericks new rotations are still settling and Powell has not yet found his footing. He has come off the bench in the two games since the trade, playing under 25 minutes in both. At this stage, both he and Maxi Kleber are strong streaming options until one of them separated from the other. Maxi Kleber (27%) – Stream: Kleber appears to be the early beneficiary after DeAndre Jordan was traded away and was the starting center Saturday. At this stage, he is slightly ahead of Dwight Powell in order of preference but both are speculative pickups. Jalen Brunson (16%) – Watch: Brunson has played 33 minutes in each of his last two games and looks set for a nice boost in value moving forward. His exact role is unclear but he should be able to produce decent assist numbers with occasional scoring and steals. Richaun Holmes (33%) – Watch: The return of DeAndre Ayton has had a significant impact on Holmes and despite the upside, he can be dropped until such time he gets hot again. Elie Okobo (23%) – Watch: After a strong game Saturday, Okobo flopped Monday, finishing with just two points and three assists in 18 minutes. Owners should keep one eye on the rookie but he appears a long way from being considered a standard league asset. Kyle Korver (17%) – Stream: Korver has hit just four triples across his past three games and does not have the upside of other three-point streaming options. If the better players have been snapped up, Korver could still provide a small amount of perimeter scoring. James Ennis (15%) – Watch: Ennis has slowly been ramping up his production, finishing with 13 points and four steals in Monday’s victory. His playing time has also increased in each of his past three games and owners should keep him in mind moving forward if you need steals and threes. Harry Giles (30%) – Watch: Giles is starting to find consistency and has certainly increased his production over the past month. He would need Willie Cauley-Stein to be traded to have a chance at standard league value right now. Either that, or if the Kings fall out of the playoff race, then he could definitely carve out a more sizeable role in the rotation. Iman Shumpert (15%) – Drop: Shumpert compiled 13 points, six rebounds, and six assists in his last game, a solid performance from the veteran. He remains in the starting lineup but typically produces very little outside of steals making him more of a deep league player. Yogi Ferrell (11%) – Drop: Ferrell exploded for 19 points Monday, most of which came during a fourth-quarter onslaught. He has the ability to score in bunches but can’t be trusted to put up consistent numbers. Bryn Forbes (40%) – Stream: The loss of Derrick White doesn’t do a lot to increase Forbes’ role, however, he remains a solid enough three-point streaming option in most competitive leagues. Patty Mills (29%) – Stream: Mills potentially stands to gain the most out of Derrick White’s absence, given his ball handling and facilitation skillset. DeMar DeRozan is also sitting out Wednesday which should benefit Mills. 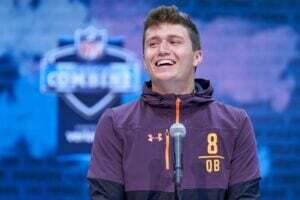 That being said, it is unlikely he will be anything more than a more rounded three-point streamer. Marco Belinelli (28%) – Stream: Much like Bryn Forbes, Belinelli should maintain a similar role moving forward and should be viewed as a three-point pickup only. 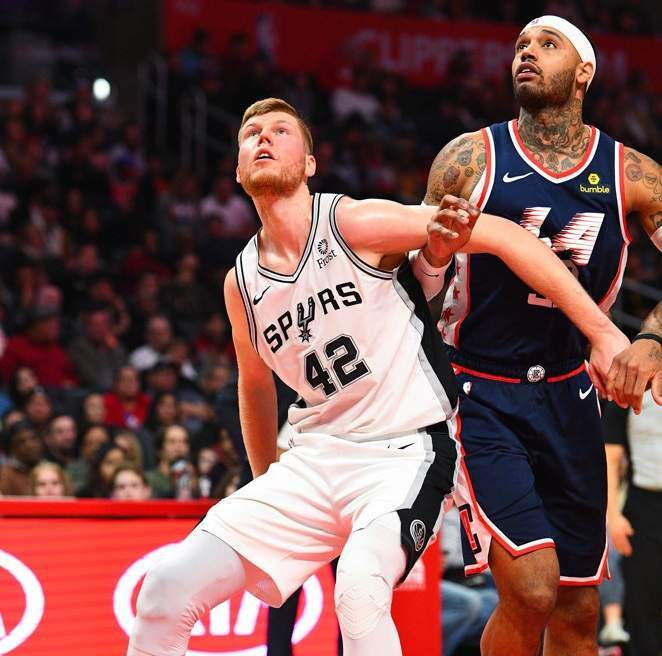 Davis Bertans (23%) – Add: Bertans moved into the starting lineup Monday and could remain there until Derrick White returns. Bertans was productive in his 34 minutes and could even maintain backend 12-team league value for the next week or two. LaMarcus Aldridge will miss Wednesday’s game due to rest which should afford more usage for players such as Bertans. Kevon Looney (33%) – Stream: Looney’s ceiling is limited with DeMarcus Cousins in the lineup but he has been able to produce defensive numbers with regularity. He has the ability to also chip in with rebounds and should be considered for streaming purposes as a player not many owners will be looking at.